Celeste Tuvi had a bad start at Mount Olive High School — and then things got worse. Tuvi got into an altercation with a male classmate her freshman year, and as a sophomore, she was hospitalized three times for an illness. “I had a controversial reputation because of the fight, and then when I got sick, no one asked me why I wasn’t as school; they just made up stories,” Tuvi said. With too much work to make up in her honors classes, she left school last June. 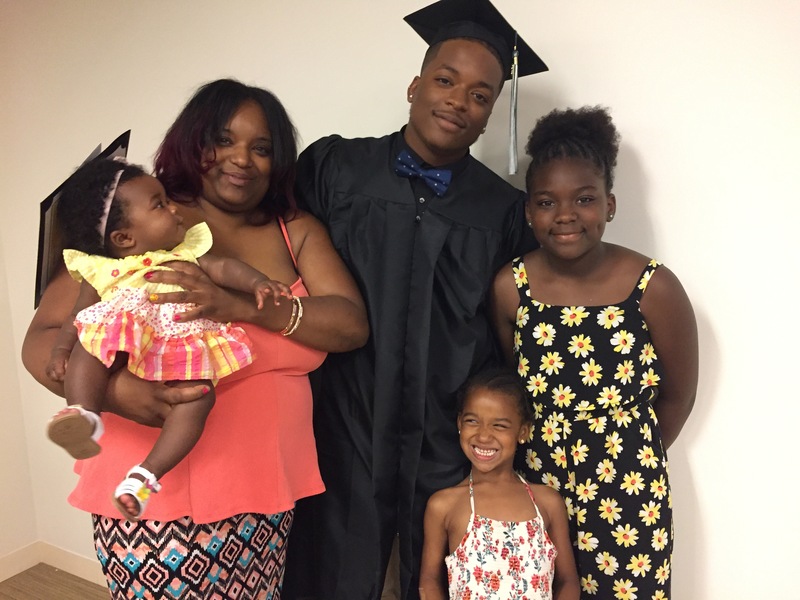 The Budd Lake resident enrolled in NewBridge Services’ alternative education program, NewBridge Jobs Plus, and by August had earned her New Jersey High School degree. “NewBridge Jobs Plus’ staff was very supportive in every way,” she said. Celeste Tuvi celebrates graduation with her family. 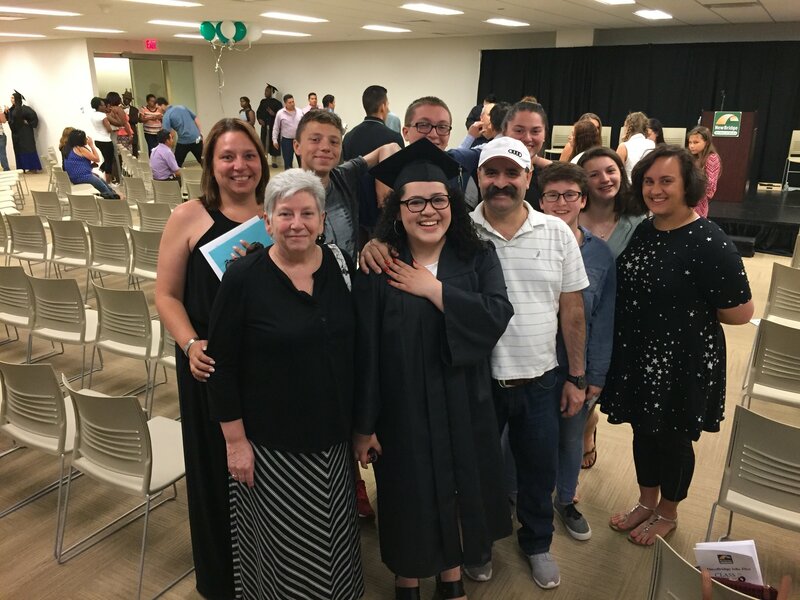 Tuvi is one of 44 young adults in the NewBridge Jobs Plus Class of 2018 and one of 33 to don caps and gowns at the commencement last night at Wyndham Worldwide headquarters. More than 200 relatives and friends cheered as graduates shared stories of perseverance and proudly walked across the stage to accept their diplomas. This year’s graduates are from Budd Lake, Dover, Flanders, Kinnelon, Lake Hopatcong, Landing, Lincoln Park, Long Valley, Montville, Morris Plains, Morristown, Mount Arlington, Parsippany, Randolph and Wharton. “I’m ecstatic. I know the potential he has, and he’s shown it,” his mother, Tanesha Refearn, said. “NewBridge Jobs Plus was a breath of fresh air. They wanted me to do my best and succeed,” said Harris, who will train to become a dental assistant at Fortis Institute in Wayne. Harris said he seeks stability, and having a good job will allow him to put himself through college once he decides what to study. “I know I can prosper in anything I decide to do,” said Harris, who received the $1,000 Wyndham Worldwide Scholarship Award. Laura Perez’ family and friends couldn’t have been prouder. Laura Perez, 18, had anxiety and depression that affected her performance at Mount Olive High School. In November, her guidance counselor suggested NewBridge Jobs Plus could help. “I had lost hope in myself, and I found it again at NewBridge,” said Perez, who received the $1,000 James Ryan Memorial Scholarship Award, named for one of NewBridge’s founders. The Budd Lake resident will study drama at County College of Morris in the fall. Nicolas Calvete said NewBridge Jobs Plus Educational Coordinator really motivated him to succeed. Nicholas Calvete said he missed a lot of classes at Morris Hills High School after becoming a father at age 16. He left in January 2017 and got a job landscaping, but his dream was to work in the medical field. He enrolled at NewBridge Jobs Plus last June. Calvete said. They also listened to his challenges of fatherhood and provided advice. “I always had someone to talk to,” said the 19-year-old Wharton resident, who will study nursing at County College of Morris in September. Tuvi, who was named NewBridge Jobs Plus Associate of the Year, is also enrolling in CCM’s nursing program. Randolph resident Christopher Grushin looked stunned when he was called up on stage to accept the $1,000 Lakeland Bank Scholarship Award. “I never thought I’d stand on one of these!” said Grushin, who will study music at CCM in the fall. Graduates heard from former NewBridge trustee Francis McEnerney, whose daughter, Meghan, graduated from the NewBridge Jobs Plus a decade ago and went on to earn a bachelor’s degree at Rutgers University. Perseverance and character are what count in life, McEnerney said. Anthony Justo, a 2016 NewBridge Jobs Plus graduate, shared how NewBridge Jobs Plus helped him finally feel connected to the world, after years of alienation that led to drug use and imprisonment. 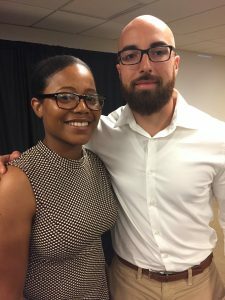 Justo is starting a personal training business, is engaged to be married, and will soon become a father. “Recognize that as long as you do your best, nothing else matters,” he told the graduates. NewBridge Jobs Plus receives funding from: the Charles Emil Thenen Foundation; Community Foundation of New Jersey; Holmes Family Foundation; John Bickford Foundation; Lakeland Bank; Morris County Freeholders; Morris County Human Services; Morris-Sussex-Warren Employment Training Services; TD Bank Charitable Foundation; United Way of Northern New Jersey; and Wyndham Worldwide.